INDIANAPOLIS – The stunning story of the 2012 season for the Indianapolis Colts spurred one final recognition for the man who manned the sidelines. Chuck Pagano was in Los Angeles Wednesday at the ESPY Awards as a nominee for the Best Moment Award. Pagano was one of four finalists for the Best Moment Award. He was nominated for his return to the sideline for the Houston finale on December 30. Pagano had been absent from the team for 12 games while waging a successful fight against leukemia. He coached the Colts to a 28-16 victory in his return, and his appearance in front of a sold out Lucas Oil Stadium crowd prior to kickoff was one of the most dramatic moments in the club’s 29 years in Indianapolis. Pagano was joined by Alex Morgan (who scored the winning goal against Canada in soccer in the Olympic semifinals), Andy Murray (winner of a gold medal in tennis at the Olympics) and Jack Hoffman (the seven-year old child battling brain cancer who was allowed to rush for a touchdown in the Nebraska spring game). Bruce Arians, now the head coach of Arizona, was on hand, too. Arians stepped in for Pagano and directed the Colts to a 9-3 mark. Arians kept Pagano’s message fresh with the players daily and nailed down a playoff berth one week prior to Pagano’s return. The Colts did not lose consecutive games in 2012, just the ninth time in 60 seasons the franchise earned that distinction. Indianapolis jumped nine games in the won-loss record to match the third-best one-year turnaround in league history. Fleener is an exceptional writer and even wrote a piece on Sports Illustrated’s Peter King last spring. In July, King had Fleener write an excerpt on the rookie symposium in King’s popular “Monday Morning Quarterback” piece. Twice this coming season, the Colts will see familiar faces on the road. Indianapolis will see Bruce Arians in Arizona and they will see Tom Telesco when visiting San Diego. Telesco served in a variety of personnel roles with the Colts starting in 1998, including last year as the chief aide under General Manager Ryan Grigson. Telesco left after the 2012 season to become the general manager with the Chargers. Telesco has risen to the top of his profession, and he remembers the steps that got him there. Telesco saw Polian reconstruct the Colts into an NFL power. After a 3-13 1998 record, the Colts surged to 13-3, then won 115 times in regular-season play from 2000-09, the NFL’s winningest decade total. At the combine last year, he was watching Grigson and Chuck Pagano take their initial steps as a duo. It was going to be a course where the pair was going to perform the same reconstructive roster process he saw Polian do years earlier. Last year, he was closer to the action than in 1998. He saw the Colts jump nine games from 2-14 to 11-5 and make the playoffs. Now, he is taking those same early footsteps with his new head coach, Mike McCoy. Telesco said he started scouting coaches a while back, during his days with the Colts. He had a great feel for Arians, yet thought the best fit was with McCoy, who served last year as Denver’s offensive coordinator. Telesco is a veteran of the business, yet he is finding out new things about himself as the top decision-maker. He is consensus-building in a new organization and has not given much thought to his working manner. “I don’t know if I even have a style. I don’t really concern myself too much with that,” said Telesco. “You come into work each day and try to find the best players you can. Part of it is building chemistry with the team and the team process. Getting to know the coaches well, getting to know the scouts and the front office that’s all a part of team building for me. When Bruce Arians pulled into the Lucas Oil parking lot Thursday morning, he stayed in the car a bit longer than normal. No, he wasn’t afraid to step back into a midwestern winter. Instead, he wanted to cherish the fourth quarter comebacks and inspirational message from a fighting friend that took place in that stadium over the last six months. 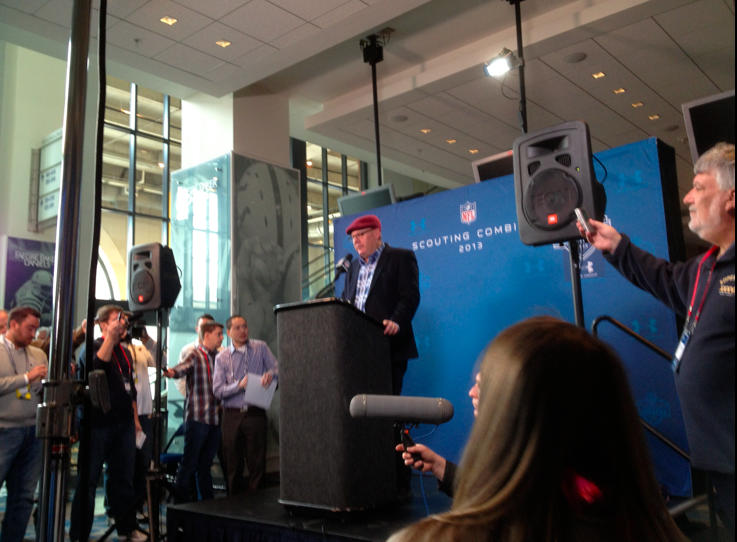 Former Colts offensive coordinator Bruce Arians returned to Indianapolis on Thursday for the 2013 NFL Combine. Arians addressed the media on Thursday morning as the Arizona Cardinals head coach. “A lot of great memories that will never be forgotten, relationships, people, that happened in this building last year that are very special,” Arians said. Arians admitted that it was going to take a whole lot to lure him away from his offensive coordinator position in Indianapolis. He found that in Arizona and will welcome his former team to the Pacific time zone next fall as the two team’s meet in the 2013 regular season for the first time in four years. Colts head coach Chuck Pagano will oppose Arians for a few hours on that weekend before their friendship quickly resumes following the final whistle. On Thursday, Arians talked about the message he gave the Colts when it was learned that Pagano would miss a significant portion of the season. “The easy part was if Chuck is fighting that fight than why couldn’t we win games? Why couldn’t we fight?” Arians said. The 11-5 record, and nine wins with Arians as interim head coach, led to a return to the playoffs for the Colts and Pagnao was able to return for a regular season finale win over the Houston Texans. Arians continued to credit the veteran leadership around the Colts locker room for not straying the course in delivering a season that will be remembered for years to come around the NFL. Yes, the highlights on the field were something that even Hollywood could not fathom but it’s the return of a friend that will stay with Arians forever. “The biggest thing for last year was I watched a dear friend get healthy. Football was a backseat the whole time to watching Chuck fight that fight and win,” Arians said. Bruce Arians was back in his normal spot on Thursday afternoon. There was the Colts offensive coordinator positioned just inside the Colts locker room as the media talked with him and defensive coordinator Greg Manusky. Arians had been handling the head coaching media requirements for the past 12 weeks but he was back where he wanted to be on Thursday. This week has not necessarily been more relaxed for Arians as come Sunday he will still be the under the watchful eye of head coach Chuck Pagano when calling the offensive plays. Returning back to his offensive coordinator position full-time, Arians is looking forward to spending a little more time on the part of the game that made him the first phone call Pagano made upon being hired back in January. Arians and the offensive staff is preparing for the Texans defense again after a one-week break from assessing Houston film. Not much has changed from a schematic standpoint Arians said, with the focus remaining in the trenches with defensive tackle Antonio Smith and defensive end J.J. Watt. “We’ve got to block 94 (Smith) and 99 (Watt), they’re the outstanding players. Their front is as good as anybody we’ve played and their secondary is good,” Arians said. Come Sunday, Arians will once again find himself down on the field sending in plays to quarterback Andrew Luck. The title of interim head coach is gone and the red challenge flag will be missing from his back pocket, two things that make Arians very happy. How much will Arians miss that red flag? “That’s the biggest thing I’m glad to get rid of,” Arians said with a smile.